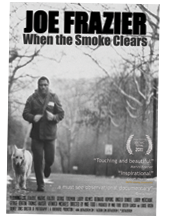 "Joe Frazier: When the Smoke Clears" is now available on DVD (NTSC format only). You can help preserve Joe's Gym when you order from Kultur.com and use code: JFNT. Plans are currently in place for a PAL release - Join JoeFrazierFilm on Facebook for updates. Radio Times says: "Smokin Joe gets his due in Joe Frazier: When the Smoke Clears"
Pick of the Day for the Observer: "A deeply moving tale"
Total TV Guide: "This moving and compelling film... lifts the lid on the private life of the late, great Smokin' Joe"
Hulu's first ever Documentary of the Month. Watch "Joe Frazier: When the Smoke Clears" FREE (US only). Click here for clips and articles on "Joe Frazier: When the Smoke Clears"